A key part of decision making is having accurate and timely data. This is even more important when managing a £540m mixed development scheme in the centre of London, which is one of the most diverse cities in the world. 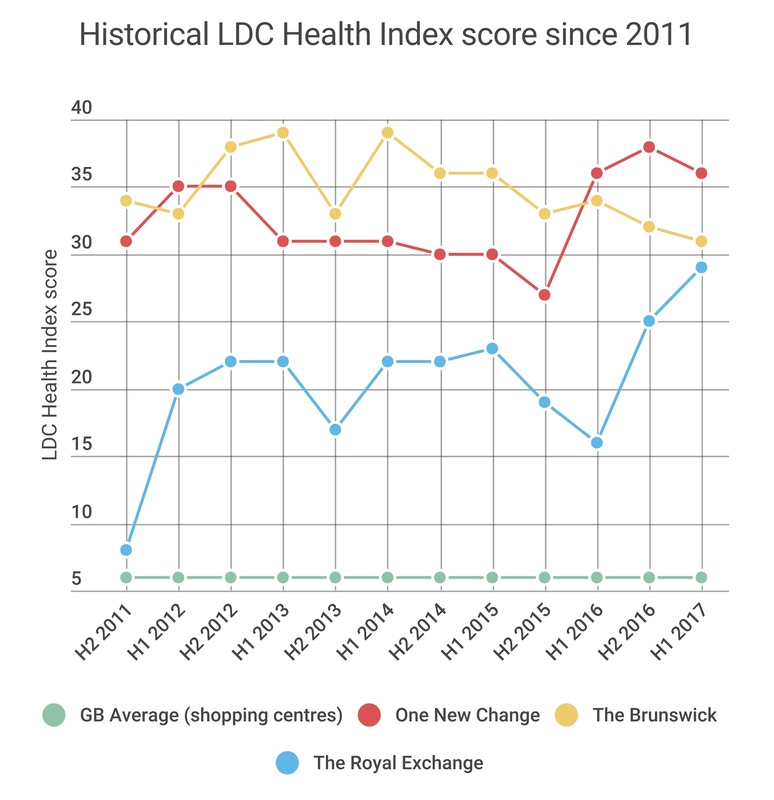 LDC data has been reviewed to understand the challenges, opportunities and strategies that can be applied to the management of One New Change Shopping Centre in central London. One New Change is located within the square mile next to the iconic St Paul’s cathedral. One New Change is one of London’s largest shopping centres with a mix of retail and leisure, as well as 341,215 sq. ft. of office space. The shopping centre is located within a 3 minute walk of St Paul’s, Bank, Mansion House and Cannon Street tube stations, so is very well connected to public transport. With the opening of the Elizabeth line in 2018 at Farringdon (Crossrail), which is only a 5 min walk away, the centre is likely to increase its catchment and footfall, creating a massive opportunity. 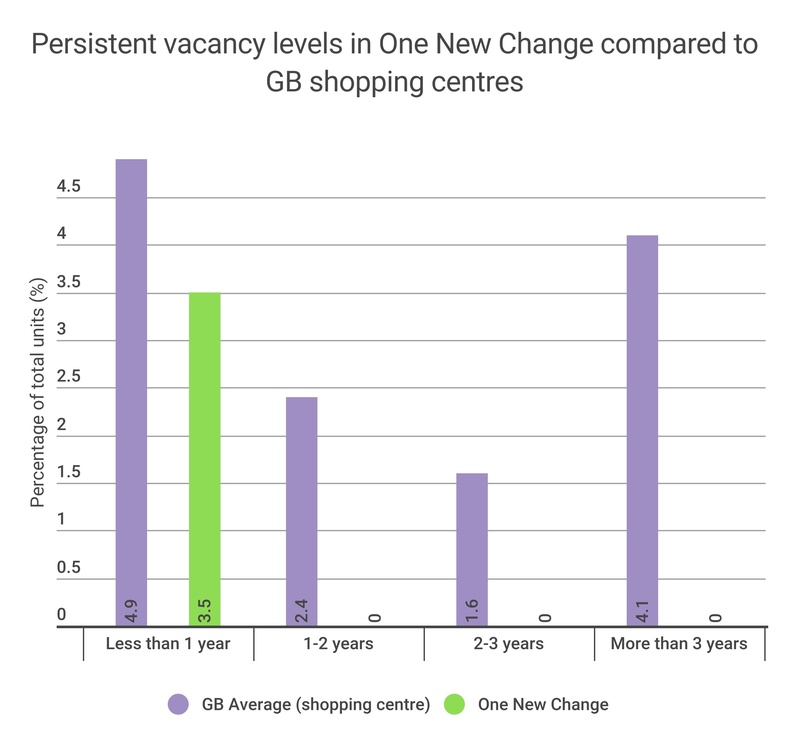 One New Change’s vacancy rate is significantly below the GB average for shopping centres at 3.5% compared to a GB average of 13.8% (see Figure 1). Recent openings include Protein Haus, Hackett and Sweaty Betty. Banana Republic was the only closure in the last two years, as their parent company closed all their UK stores. This centre currently has no long term vacant units, with 0 units vacant having been vacant for over one year (see Figure 2). This is an indicator of high tenant demand for space in One New Change, as well as the strong performance from existing tenants. Shopping centres with units vacant for over one year risk having to offer better incentives to try and attract occupiers to take up space. This can have a long term impact on cash flow, with rent free periods and capital expenditure contributions cutting into revenue. One New Change’s occupier mix is tailored to match its catchment. The large number of takeaway food shops (18% of total units), attract the local working population with chain such as Eat., Wasabi, Burrito Mama and Pho, meeting this growing demand. Londoners on average spend £6 per day on lunch, with this significantly higher than anywhere else in the UK (Source: iZettle). 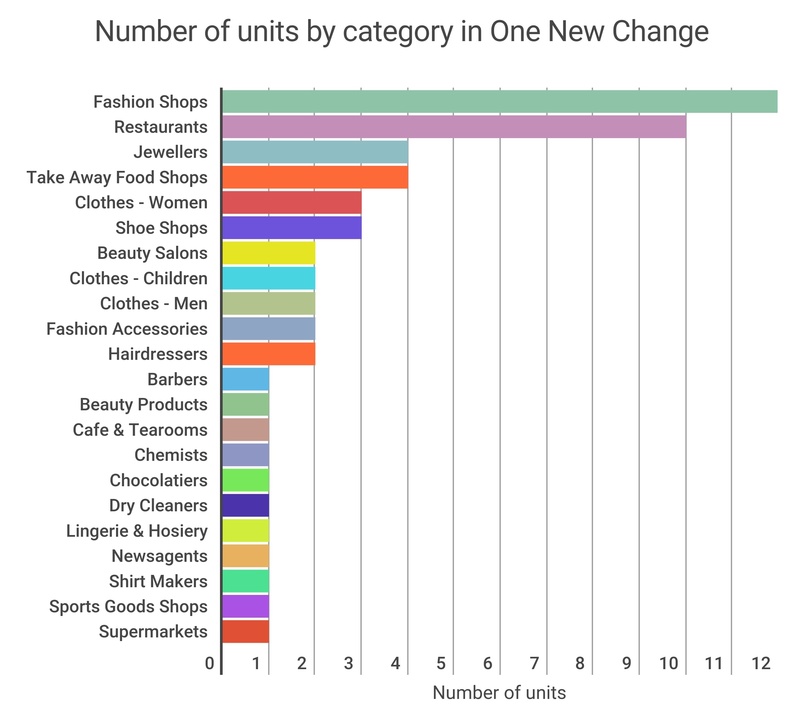 One New Change also has a strong line up of Fashion shops that make up 21% of the total units, with popular brands such as H&M, Reiss, COS and Next. Fashion shops are facing the biggest challenge from technological advancements and changes in shopper behaviour, with ever growing online sales and Click & Collect services. One New Change is set to benefit from this with these stores' proximity to the Square Mile and several tube stations, making them ideal stores to house Click & Collect pick up points. In 2016, nearly 89% of all UK retail sales still involved a physical store either in the collection or initial buying decision (Source: Verdict). 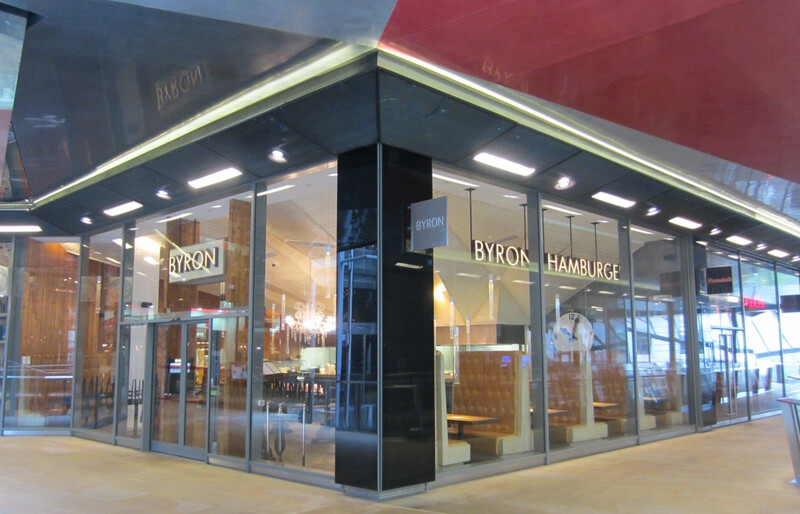 One New Change has a diverse F&B offer with a selection of casual dining restaurants that help to extend the trading in the shopping centre, such as Byron in Image 1 below. This offer attracts not only the local working population, but tourists in the city who may be visiting the various tourist attractions such as St Paul’s cathedral. This enables the centre to have consistent footfall throughout the day and night. One New Change's main competing shopping centres within a 5-mile radius are The Brunswick and The Royal Exchange. The Brunswick has fewer fashion retailers, with only L.K Bennet and Office shoes having a store in both centres. Due to The Brunswick being a mixed development with residential properties, the offer is more convenience and service retail led with Superdrug, Waitrose, Sainsbury’s Local, Boots and Specsavers being the main occupiers. The centre does have a similarly strong F&B line up with a Nandos, GBK, Las Iguanas and a Carluccio’s all supported by a Curzon cinema that allows them to operate longer hours. The Royal Exchange shopping centre near the Bank of England has a different target customer base, with a more premium retailing offer. 84% of their comparison retail is premium, compared to only 40% in One New Change. Therefore, they are unlikely to be in direct competition due to their different retail experiences. 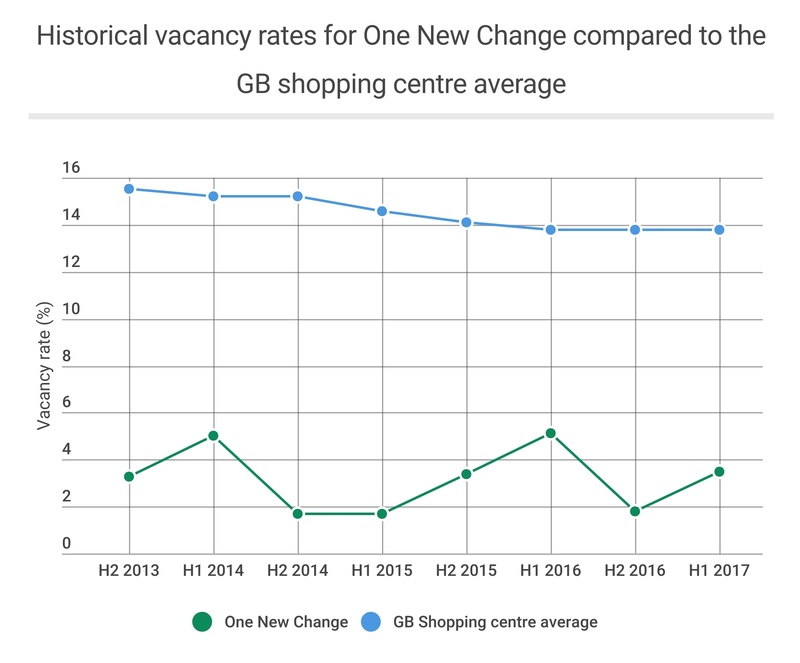 Our data outlines the historical occupancy of the One New Change, the occupier profile and how this is tailored to the target catchment and finally the competing shopping destinations that are competing for the same consumer spend. One New Change is located in the heart of the city, with great transport links, a large affluent working population and an attractive group of retail and leisure brands. This is reflected in its 8/10 LDC Health Index rating, which places it in the top 25% of shopping centres across GB.